The uptick in stabbing and vehicular attacks in France bears a strong resemblance to previous Islamic State (IS)-inspired and linked attacks. This wave follows the August 22 call to action from IS leader, Abu Bakr al-Baghdadi, who asked supporters to “strike the West” and emphasized vehicular attacks in particular. IS appears to have been particularly successful in radicalizing young Muslim immigrants in France. Authorities are likely downplaying the militancy links in order to offset the increasing media attention surrounding such attacks. Travel to France may continue while remaining cognizant of the increased threat of militant attacks. On September 14, a car-ramming attempt was recorded along Rue Racine in Nimes, southern France, during the early morning hours. The assailant reportedly intended to drive his car into pedestrians before being stopped by security barriers at around 01:30 (local time). The suspect was consequently subdued by locals in the area and later arrested by police. Reports quoting local eyewitnesses during the incident stated that the suspect shouted “Allahu Akbar”. On September 10, an individual was detained for reportedly forcibly driving through multiple barriers and entering the runway of Lyon-Saint-Exupery Airport (LYS) in Lyon. The suspect was subsequently arrested following an extensive police pursuit. The incident caused significant delays and cancellations to flights. Following the arrest, a member of Lyon Prosecutor’s office reportedly stated that the assailant had alluded to a militant motive, claiming he was instructed to carry out the incident by Allah. However, this was later retracted. The incident followed a September 9 stabbing attack in the 19th Arrondissement of Paris, when an assailant reportedly stabbed and injured at least seven people, including two British tourists, on Quai de Loire Street and Rue Henri Nogueres during the late night hours. The suspect was reportedly an Afghan national. Authorities appeared reluctant to label all three attacks as being militant-related, calling the Nimes attack a “deliberate homicide”, and saying that the assailant who carried out the September 9 Paris stabbing attack did not appear to have militant motives. All three incidents were carried out by individuals of Muslim backgrounds and all three methods align with modus operandi that has been explicitly and repeatedly called for by the Islamic State jihadist group. On August 22, the (IS) al-Furqan media released an audio recording of the group’s leader Abu Bakr al-Baghdadi, who called upon the group’s supporters to “strike the West” through stabbings, bombings, and vehicular rammings, particularly emphasizing the last method. Al-Baghdadi then stated that “one such attack equals one thousand attacks in the Middle East and North Africa”. On August 23, an assailant killed one and injured two in a knife attack in Trappes, Yveline, located 26 km from central Paris. The attacker reportedly shouted ‘Allahu Akbar’ and threatened police officers who arrived at the scene, and was later neutralized. Shortly after, IS-linked media reported that the assailant was a soldier of the Caliphate and conducted the attack in response to the group’s calls to “target the coalition countries”, referring to the US-led coalition of states that orchestrated a number of airstrikes against IS strongholds in 2014. 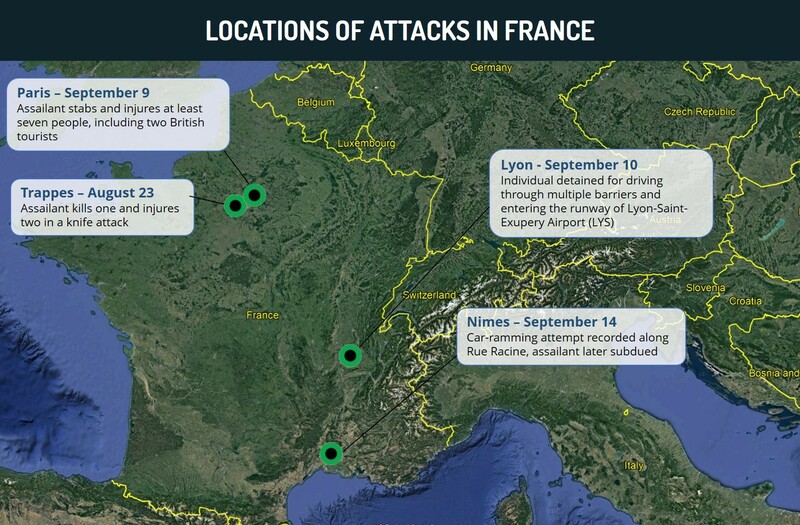 Following the 2014 offensive, an IS spokesman had specifically singled out France as a target for future attacks. Despite authorities’ reluctance to label the above-mentioned incidents as being IS-inspired militant attacks, various factors indicate that they may, in fact, have some connection to the group’s ideology and professed methods. In particular, the assailants resorted to stabbing and vehicular attacks in locations with a considerable civilian presence, which, in recent times, have been IS-linked lone-wolf actors’ chosen modus operandi. The assailants also chose to indiscriminately target these civilians and intended to cause widespread harm. The known profiles of the attackers, who belong to immigrant communities who widely follow Islam, and the chanting of ‘Allahu Akbar’ during the attacks in at least two confirmed cases, is consistent with the details from similar previous IS-linked attacks. This lends credence to the possibility that the attackers’ actions were informed by a religious and ideological motive, in addition, it is equally likely that psychological instability also played a part in their motivations. The link to IS is also strengthened by Baghdadi’s specific emphasis on the effectiveness of vehicular attacks in the August 22 call to action, which in turn was likely precipitated by the April 2018 airstrikes carried out by France and other countries in Syria, in response to the alleged use of chemical weapons by the state. In this case, the call was rather a wider propaganda piece, which was answered, and there is no evidence to suggest that any of the attackers had specific contact with IS in the Middle East or had been in touch with handlers. Due to the targeted locations being distant from one another, and absence of uncovered network between the suspects, it is likely that the attacks were not related, despite being conducted in quick succession. However, the attacks point to the potential success of IS propaganda and recruiting in France. The group has emerged as a viable outlet for Muslims who feel alienated from the wider community, exploiting feelings of disenfranchisement by offering them an alternative, in terms of belonging to the larger radical Islamist community. Particularly, feelings of alienation among Muslim immigrants have likely been heightened by government policies such as the 2010 ban on religious face veils and head coverings, seen as being exclusionary, which have consistently prompted a backlash from both minority communities and their supporters, as well as anti-immigrant groups. Domestic factors such as a high unemployment rate and job discrimination against Muslims, religion-based tensions, as well as the general political culture of government criticism, also continue to contribute to making the immigrant population more susceptible to radicalization. As has been seen in the past, IS also provides a useful narrative to psychologically-disturbed individuals, who then carry out copycat lone-wolf attacks using IS modus operandi, seeking to capitalize on media attention surrounding the IS ideology. Further, it is notable that authorities have not indicated that any of the September attacks were militant-related, despite suggestions, as evidenced above, that the assailants were at least influenced by IS, if not directly linked. This reflects a reluctance to label such lone-wolf attacks as Islamist militancy, possibly to discourage the media narrative against, and resultant disaffection within, Muslim immigrant communities in the country. This unwillingness to attribute the incidents to militancy could also be a result of a conscious government decision to reduce the inadvertent aiding and abetting of IS’ operations, as the group has been known to use such official statements after attacks to legitimize itself as a threat to the West. Additionally, the government could be seeking to avoid heightened criticism of its security policy, especially amid the current administration’s declining public approval ratings. FORECAST: IS’ online presence and recruitment methods, in addition to the persistent domestic factors alienating the Muslim community in France, the global trend of young men using mass violence as an outlet for psychological frustration, and IS has tapping into this trend to further its agenda, makes it likely that further such attacks will occur in France over the coming weeks and months. Given the apparent shift in executive security policy towards mitigating the media clout of militant attacks in general, it is likely that authorities will continue miIslamist islamist motives in such attacks. During the early morning hours of April 14, the US, UK, and France fired more than 100 cruise missiles against Syrian government facilities in Homs Province and near Damascus. The strikes are likely an effort by the West to deter the Syrian government from further use of chemical weapons, as well as to send a message to Iran and Russia, amidst their perceived expansion across the Middle East. The attacks are unlikely to significantly impact the Syrian conflict on-the-ground in the long-term, given pro-government forces’ overall superiority over rebel forces. While tensions will increase between the parties, an escalation of hostilities between Russia and the West remains unlikely at this time. Iranian-backed groups may target US interests and allies across the region over the coming days. We advise against all travel to Damascus and Aleppo, given the general threat of indiscriminate aerial bombardment and artillery shelling from government forces as well as attacks by various militant groups. Attacks by rebel forces may include the use of rocket propelled grenades, suicide bombings, and mortar attacks. During the early morning hours of April 14, the US, France, and the UK conducted multiple strikes against Syrian military facilities across Syria, with approximately 120 cruise missiles fired at these targets. The strikes, which were carried out from naval vessels in response to the suspected chemical attack by the Syrian government against the town of Douma on April 7, targeted government military facilities in Homs Province and the Damascus area. Near Damascus, US Tomahawk missiles hit Kiswah Military Base, Mezzeh Airbase, Dumayr Airbase, as well as a scientific research facility in Barzeh District. In Homs Province, the attacks, which involved the UK’s Shadow Storm cruise missiles, targeted a scientific research facility in Qusayr District. At the time of writing, while French forces also carried out missile attacks, their exact targets and scale are yet to be known. According to pro-government forces, the Syrian Arab Army’s (SAA) air defense systems intercepted the “majority of the US fired missiles at the Damascus’ area”. While at the time of writing the exact number of casualties is unconfirmed, according to pro-government media outlets, three civilians were wounded as a result of the attack. US Secretary of Defense James Mattis stated,“Right now, this is a one-time shot”. UK Prime Minister Theresa May stressed that there was “no practicable alternative to the use of force”. However, May also stated that the strikes were not about “regime change”. The Russian Foreign Ministry Spokesperson condemned the missile attacks. The spokesperson further stressed that there were no Russian casualties as a result of the strikes. The strike highlights our previous assessments that the Western response to the chemical weapons attack will be localized and target facilities linked to the use of chemical weapon, although they were larger than last year’s US response to the Khan Shaykhun incident. The use of cruise missiles, which allow attacking targets from a standoff distance, was likely meant to avoid any potential risks associated with operating in or near Syrian government airspace.Because the strikes hit research centers and storage facilities, the West’s response will likely impede the short-term capabilities of the Syrian government to use chemical weapons. However, in the medium-term, particularly in light of recent reports that the Syrian government transferred some of their weapons and forces away from multiple bases, these capabilities were likely not be significantly damaged and it is therefore possible that further attacks using chemical agents may be witnessed across Syria over the coming weeks and months. In spite of the still relatively limited scope of the strike, the West’s operations in Syria are likely symbolic and meant to deter the Syrian government from using such weapons, especially because of the large number of targeted bases and installations. The strikes also aim to prevent the “normalization” of the usage of chemical agents across the globe, as these type of weapons had been used persistently throughout the Syrian conflict. Despite the low likelihood that many missiles were actually intercepted, if at all, these claims by the Syrian government, as well as the lack of significant casualties among pro-government forces, will likely be capitalized on to bolster its image among its troops and supporters across the country. Coupled with the aforementioned assessments regarding the potential for further chemical attacks by the SAA, the strikes’ deterrence impact will also be limited. Globally, the development comes amidst an uptick in tensions between the West and Russia over Moscow’s perceived aggressive policies across the globe. These include Russia’s intervention in Ukraine, alleged interference in elections in Western countries, as well as most recently, the suspected attempted assassination of a Russian national in the UK. The West likely used these attacks to deter Moscow from engaging in further actions perceived as hostile towards the West and its allies. In the Middle East, the strikes occurred amidst growing concerns among Western allies, chiefly Israel and Saudi Arabia, regarding Iran’s growing regional influence, including in Syria. The Western strike against Tehran’s important ally, is likely an attempt to intimidate Iran and send a message that its actions are not unnoticed. FORECAST: In the short-term, the US-led operations may slightly impact the situation on-the-ground in the vicinity of the targeted facilities. In addition to hindering their operational capabilities, the strikes also led pro-government forces to reportedly transfer some of their weapons and vehicles away from bases. This now forces them to redeploy and reorganize. During this period of time, rebel forces may exploit the possible disarray from the strike and launch assaults on government-held territories and capture some areas from the Syrian government. This is especially likely on fronts near targeted facilities, such as the rebel enclave in the Dumayr area, northern Daraa Province, and northern Homs Province. Nonetheless, in the medium- to long-term, given the strikes’ limited scale and overall superiority of pro-government forces vis-a-vis rebel forces, the developments are unlikely to significantly impact the situation on-ground, with the SAA and its allies likely reversing any possible short-term gains by rebel forces. The attack by the US, France, and the UK does not represent a shift in the West’s policy regarding the Syrian conflict. This is highlighted by the statements of these countries’ officials that the strikes are a singular, isolated response. However, should the use of chemical weapons persist, additional missile strikes, as well as air raids to a lesser degree, may reoccur over the coming months, targeting the Syrian government’s military facilities. The operations are liable to increase the already heightened tensions between Moscow and the West. However, particularly given the lack of reports about Russian casualties as a result of the missile attacks, an escalation of hostilities between Russia and the US, UK, and France remains highly unlikely at this time. Instead, Moscow’s response will focus on diplomatic measures against these three countries, such as sanctions. This assessment is highlighted by the April 13 bill by Russia’s Duma to implement sanctions on US alcohol, tobacco, and agro-products. Additionally, cyber attacks by Russian hackers against government institutions in the UK, US, and France may also be witnessed over the coming days. The events are unlikely to have a significant impact on regional dynamics as a whole. However, it remains possible that a localized retaliation by pro-government forces and Iranian-backed militias will take place against US troops and their backed forces in Syria, such as the Syrian Democratic Forces (SDF) in northeastern Syria and factions within the Free Syrian Army (FSA) in southern Homs Province. Should this occur, it will likely include mortar fire and IED detonations. Attacks against US interests may also occur in Iraq, where such actions have occurred in the past. Iranian-backed elements throughout the region may also seek to target countries that are considered Western allies. This mainly includes Saudi Arabia, as the Shiite Houthis may be directed by Tehran to intensify their ballistic missile attacks deep in Saudi territory. Additionally, albeit to a much lesser degree, it cannot be ruled out that Iranian-backed groups, such as Hezbollah and some Palestinian factions, will target Israel, including in the form of IED and anti-tank guided missile attacks against Israel Defense Forces (IDF) troops along the border with Syria. Those remaining in Damascus should ensure that contingency and emergency evacuation plans are updated due to the potential for further deterioration in the security situation. Avoid all travel to outlying areas of the city given the persistent threat of militancy. Those seeking to enter Syria are advised to confirm the status of their crossing points and final destinations, remaining aware of recent kidnapping incidents and the nature of military forces deployed in those areas. A meeting between Tuareg separatists and the Bamako government is scheduled to take place on July 16 in Algiers. This will be the first meeting between the Tuareg rebels and the Bamako government since violent protests in May during the visit of Prime Minister Moussa Mara to Kidal, which was followed by the Malian army’s attack of rebel positions, in which 50 government troops were killed. Despite the planned holding of an international dialogue in Algiers on July 16, there has been a clear deterioration in the security situation in the north of the country and militants have reportedly deployed to key locations, stockpiling weapons and food in an apparent preparation for a return to conflict. Clashes were reported in Anefife, near Kidal on July 11 in which at least 35 combatants were killed. Anefife was previously under the control of the Tuareg rebel National Movement for the Liberation of Azawad (MNLA). 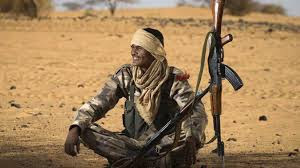 An MNLA statement claimed that the group attacked a coalition of pro-Bamako militias including the Arab Movement for Azawad (MAA), elements of the Malian Army, and militants of the Movement for Oneness and Jihad in West Africa (MOJWA). Military sources have denied these claims, attributing the violence to in-fighting amongst separatists, and claiming that the majority of those killed were members of the MNLA and the MAA. Hey Buddy!, I found this information for you: "MAX Analysis Mali: Government, Tuareg relations deteriorate ahead of July 16 meeting; revamped French mission likely to improve security in long term July 15, 2014". Here is the website link: https://www.max-security.com/reports/max-analysis-mali-government-tuareg-relations-deteriorate-ahead-of-july-16-meeting-revamped-french-mission-likely-to-improve-security-in-long-term/. Thank you.